Readings: Jeremiah 31: 31-34; Psalm 34; 1-10; Revelation 7: 9-17; and Matthew 5: 1-12. 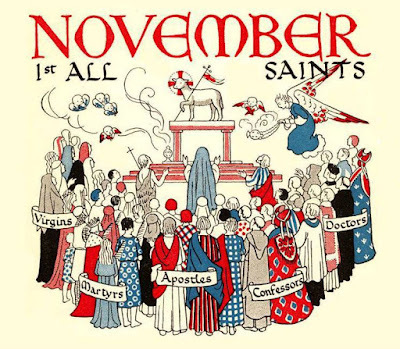 Today is All Saints’ Day in the Calendar of the Church, and although there is a provision in the Calendar and Directory of the Church of Ireland that allows us to celeb rate All Saints’ Day next Sunday [5 November 2017], I thought it would be a good idea to celebrate this feast day on the day itself, and to invite us all back to rectory for tea or coffee. 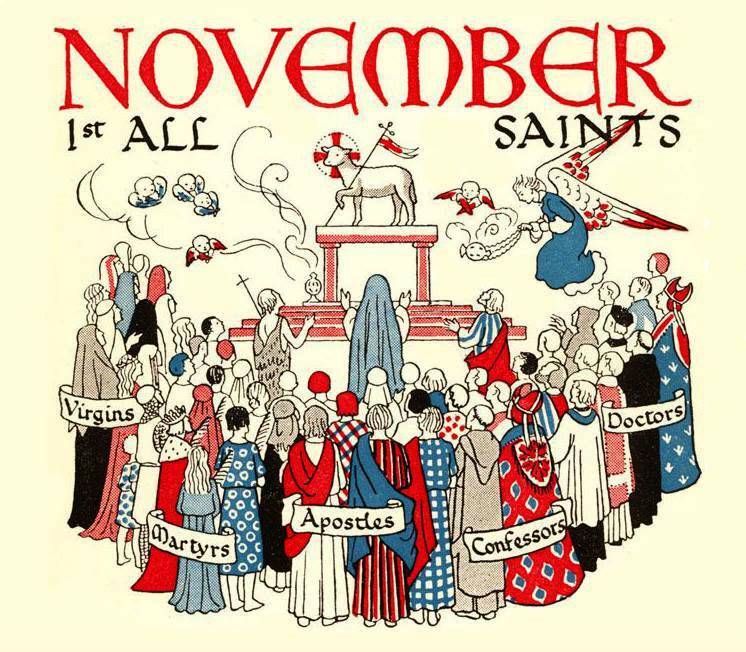 After all, All Saints’ Day is one of the 12 Principal Feasts of the Church. From the third century, there is evidence of celebrations of All Martyrs. The Eastern Church continues a fourth century tradition of the ‘Sunday of All Saints’ being celebrated on the Sunday after Pentecost. So, who is your favourite saint? Saints do not have to be martyrs. But in recent weeks there was a major commemoration in Westminster Abbey of Oscar Romero, a very modern martyr, to mark his 100th birthday. Saints do not have to be canonised. I think of modern martyrs such as Martin Luther King and Dietrich Bonhoeffer, or of Heather Heyer, the civil rights activist who was killed by far-right neo-Nazis and racists in Charlottesville, Kentucky, a few months ago. Saints do not have to be canonised. I think for many of us we know that the people who handed on the faith to us from previous generations – teachers, grandparents, perhaps neighbours – even though they may be long dead by now, are still part of our vision of the Communion of Saints. Saints do not have to live a perfect life … none of us is without sin, and none of us is beyond redemption. Some of the saints carved on the West Front of Westminster Abbey might have been very surprised to know they were going to appear there. But their lives in sum totals are what we are asked to think about. And saints do not have to be shrouded in superstition. Yes, there are popular saints in working class Dublin, including Saint Blaise for blessing sore throats and the reverence shown to Saint Valentine in Whitefriar Street Church, particularly in the run-up to Saint Valentine’s Day. But saints, instead, are supposed to be examples of holy living. Some years ago, in Wednesday morning tutorials, I asked students to come along with stories of their favourite ‘saints and heroes.’ And they included an interesting array of people, some of them still living. In the back-page interviews in the Church Times, people are sometimes asked who they would like to be locked into a church with for a few hours. Who are your favourite saints? Who would you like to learn from a little more when it comes to living the Christian life? In our Gospel reading (Matthew 5: 1-12) this morning, Christ tells us who his saints are. Some years ago, Father Brian D’Arcy quipped in a radio interview how Dorothy Day once spoke of how her fellow Roman Catholics went to confession regularly and confessed to ‘breaking’ one of the Ten Commandments, but she wondered how often they confessed to ‘breaking’ one of the Eight Beatitudes. On Sunday morning, at the Family Eucharist in Holy Trinity Church, Rathkeale, we saw how the Ten Commandments can be grouped into two sets, those about loving God, and those about loving others. So too, we might see the Beatitudes set out in two groups of four. The first four are inward looking: the poor in spirit, those who mourn, the meek, and those who hunger and thirst for righteousness. The second four are outward looking: the merciful, the pure in heart, the peacemakers and those who are persecuted. The Beatitudes are culturally embedded in our society, in our literature, in our arts. But they need not just to be thought about, but to be lived out. Writing on the financial pages of The Guardian some years ago [17 January 2011], Terry Macalister wrote: ‘From Tolstoy to Dostoevsky to Chekov, if anyone can tell a good story it’s the Russians. Well, in Chapter 2 of Boris Pasternak’s great Russian novel Doctor Zhivago, Larissa Feodorovna Guishar, who “was not religious” and “did not believe in ritual,” was startled by the Beatitudes, for she thought they were about herself. (Revd Canon Professor) Patrick Comerford is Priest-in-Charge, the Rathkeale and Kilnaughtin Group of Parishes. This sermon was prepared for the All Saints’ Day Eucharist in Saint Mary’s Church, Askeaton, Co Limerick, on Wednesday 1 November 2017. 459: ‘For all the saints, who from their labours rest,’ by Bishop William Walsham How (1823-1897). S anctity is not reserved for just the "chosen few"
A ll of us must live our lives with this one end in view. T his was the great secret of one saint's "little way".